Santa Clara Callers Association- President 2009, 2010 Vice President 2002, 2007, held other offices over the past 20 years. Past Vice Chairman of CALLERLAB's Website Committee and Youth Committee. 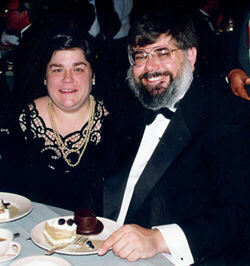 Co-Author of Top to bottom Caller Note Service with husband John (currently ceased publication). I operate a Caller's school for those calling up to 5 years. Only known caller/instructor with tracheotomy.